Paris in 1789 is a labyrinth of twisted streets, filled with beggars, thieves, revolutionaries - and magicians . . . When smallpox kills her parents, seventeen-year-old Camille is left to provide for her frail sister and her volatile brother. In desperation, she survives by using the petty magic she learnt from her mother. But when her brother disappears Camille decides to pursue a richer, more dangerous mark: the glittering court of Louis XVI and Marie Antoinette. Using dark magic Camille transforms herself into the 'Baroness de la Fontaine' and presents herself at the court of Versaille, where she soon finds herself swept up in a dizzying life of riches, finery and suitors. But Camille's resentment of the rich is at odds with the allure of their glamour and excess, and she soon discovers that she's not the only one leading a double life . 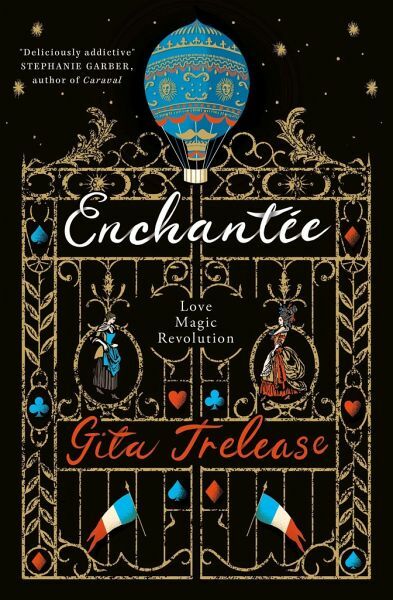 . . Enchantée is a compelling historical fantasy and is Gita Trelease's debut novel. Born in Sweden to Indian and Swedish parents, Gita Trelease has lived in lots of places, including New York, Paris and a tiny town in central Italy. She attended Yale College and New York University, where she earned a Ph.D. in British literature. Before becoming a novelist, she taught classes on writing and fairy tales - some of which have seeped into this story. Along with her husband and son, Gita divides her time between an old village in Massachusetts and the coast of Maine, where she's still searching for a secret portal that will take her back to Versailles. Enchantée is Gita's debut novel.